I still have doubts about whether this relationship contract found and tweeted by Longform.org founder Max Linsky (@maxlinsky) today is real. But I'm going to officially choose to believe that it is. Because that choice allows me to officially acknowledge it as the greatest thing I've ever seen. Also, it being real means it was created by the best 8th grader who's ever existed. If there were some sort of draft lottery for future VSB contributors and editors — and future mentors for my daughter — this kid (who I'm assuming is a girl) would be the first pick. She'd be the Lebron James of future blogger/daughter mentor 8th graders. It'll also allow me to incorporate "fist bump these hoes" into my general lexicon, as this is a phrase I never knew I've always needed in my life until I actually saw it. 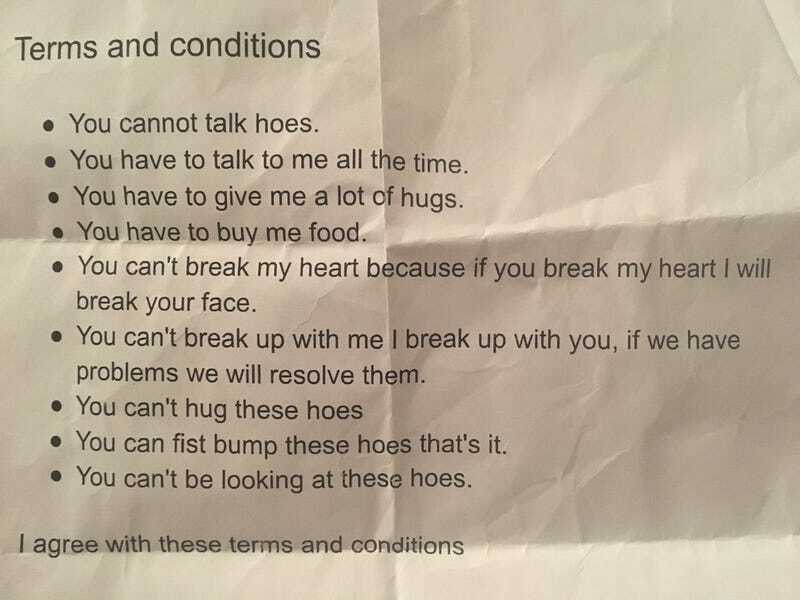 And, although this is a contract created by an 8th grader and apparently signed (!!!) by another, it's a surprisingly accurate and succinct distillation of adult relationship expectations too. Feed me, hug me, don't hug hoes —- really, what else is there?